Summer and hot dogs go together so well. Sure, I love burgers (a lot), but hot dogs have this level of nostalgia for me that burgers don't. I suppose hot dogs are a "kid" thing, a simple sandwich of buns, dog and ketchup (and if you're a kid, probably nothing else). Hot dogs roasted on a stick over a campfire--especially a beach campfire--is one of the quintessentially perfect summer meals. Follow the dogs with toasted marshmallows for campfire cooking perfection. Adults, however, have been getting in on the hot dog game lately, coming up with inventive ways to serve and garnish them. I still think the best hot dog is simple: a toasted bun, a single sauce and no more than one or two other garnishes. But what those sauces and garnishes are is where it's fun to get creative. 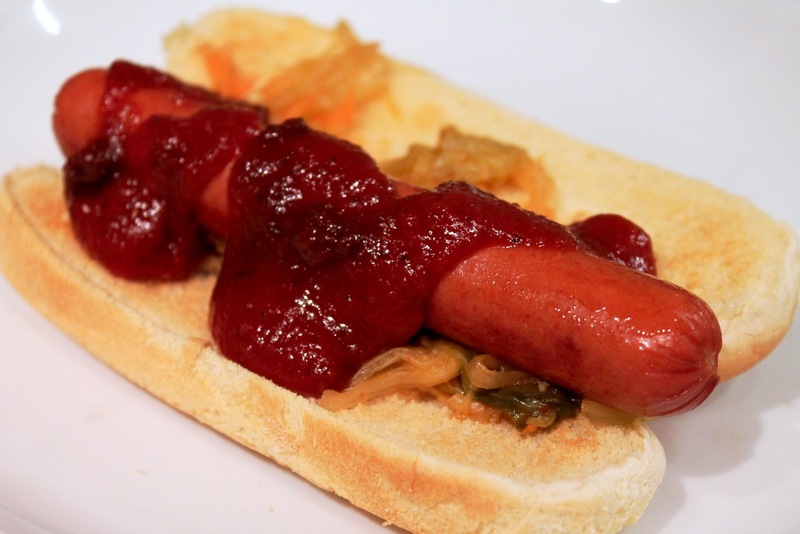 This Korean-inspired hot dog is in keeping with that simplicity. I used Hebrew National beef franks, but Nathan's Famous would be good too. I also used plain hot dog buns lightly toasted under an oven broiler. Be sure to watch them carefully, as they will go from nicely toasted to burnt quite fast. What makes the hot dog Korean is the kimchi, a cabbage-heavy fermented Korean vegetable side that makes a perfect hot dog garnish. Although it is often spicy, there are mild varieties available. The other thing is the sauce: I used Ketchung Signature Sauce, a locally made spicy tomato-based sauce sweetened with brown sugar and given heat with Tabasco pepper mash. It's a lot like Ketchup--the name is actually a mashup of ketchup and Chung, last name of Ketchung creator Helen Chung. Helen's husband and Ketchung co-founder David gave me a bottle at a recent food bloggers event. Since I love ketchup--and who doesn't--I was happy to give it a try. The sauce is really good: it's a got a nice tomato flavor with some definite peppery heat. 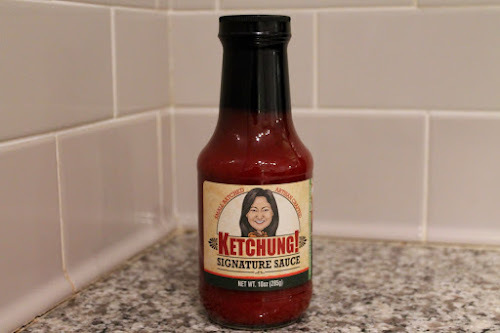 In addition to the signature sauce, Ketchung also makes a barbecue sauce. Ketchung is available from a number of outlets in D.C., Maryland and Virginia. You can also buy it online from Ketchung directly. They're website features a number of recipes for using the sauces. 1. Cook the hot dogs. If you're outside with a campfire that's burned down to coals, stick a long stick through one end and warm the hot dog over the coals, turning to heat and lightly brown the dog evenly. If you're at home, heat them in a frying pan over moderate heat until lightly browned on the outside and warmed through (hot dogs are already cooked, so you're just warming them and crisping the skin a bit). 2. Preheat an oven broiler. Carefully split open the hot dog buns and set them crust-side-down on a baking sheet. Broil until the white side is lightly toasted, about 30 seconds to 1 minute (watch carefully, as they can burn fast). You can brush the buns with olive oil but you don't have to. 3. Serve the hot dogs in the buns garnished with kimchi and Ketchung sauce.